Medical Spa MD: A clinician community for physicians in laser clinics, medspas, or plastic surgery and dermatology who offer nonsurgical cosmetic treatments. Medical Spa MD: A community of clinicians in nonsurgical cosmetic medicine. Medspa MD members are plastic surgeons, dermatologists, aesthetic physicians as well as medical technology companies, concierge practices, skin clinics, laser centers, and other medical and business professionals who are involved or interested in nonsurgical cosmetic medicine around the world. NOTE: THIS SITE IS FOR CLINICIANS. IS NOT A SITE FOR PATIENTS. Please do not ask medical questions. This is NOT a site for patients. The physicians on this site can't tell you what you should do or what would be best for you. That's a medical diagnosis, not a comment. New Member? Get Started Here. What you'll find on Medical Spa MD? Our contributing authors are thought leaders who are in the trenches with you. They're sharing their expertise and the lessons they've learned. We also have fantastic guest posts. Get the answer you're looking for. Our forums cover a wide range of topics; marketing tactics, business operations, treatment settings for specific lasers, technology comparisons, staff compensation and pretty much anything else you might ever want to know. Buy or sell a laser, IPL, or even a clinic on our classified ads site. It's simple to use and open to all of our members and we don't take any middle-man fees. Select Partners are those businesses that offer benefits to our members like special member only offers, reduced pricing, group buying programs. In all cases they offer white glove treatment of our members. We regularly survey physicians and clinics to find out what's going on in the market and provide this information back to our members. What is Medical Spa MD? Medical Spa MD is an open resource for all physicians and clinicians involved in cosmetic retail medicine around the world. I started this site in response to the deluge of emails and inquiries I was receiving from physicians. After becoming frustrated with the lack of anywhere you could find relevant and balanced info, we decided to launch a site where problems and issues were able to be addressed and where physicians could voice and get access to honest opinions from other clinicians. 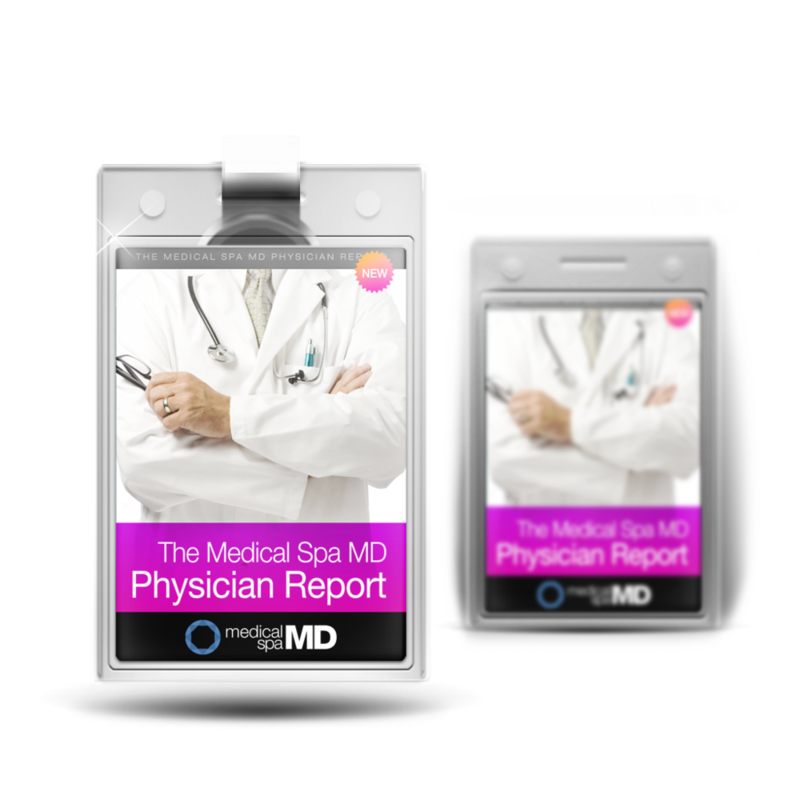 How does Medical Spa MD differ from other sites? In general, most sites are built on advertising models and they can't write anything that might offend potential advertisers. This prevents them from providing information other than 'marketing messages'. We started with a different model. Although there are advertisers on this site, the most valuable content on this site comes directly from clinicians who are either authors, guest posting, or commenting and communicating with each other in the forums. In addition, we don't just cover the clinical but also delve into 'business' areas like patient marketing and business operations. Who writes Medical Spa MD? All of our Contributing Authors as well as those who send us guest posts and others in our community. Why doesn't everyone identify themselves? No. Many members and others do not directly identify themselves. There are a number of reasons for this. First, many physicians don't like to post any type of medical information in which they may be identified as the author. In some cases they're posting information about companies or technologies that they're currently working with. If it's unflattering, they'd rather not be personally identified by the people they're dealing with. Additionally, since we have physicians and readers from around the world, there are differences in privacy laws, patient compliance, licensing, scope of practice and many other areas. You can choose to identify yourself or remain anonymous. However you want. There is a huge amount of information and it's continually growing. There are also a lot of people who are in the same situation you are and are willing to share their experience and know how. If you have a relevant question, just post it in the appropriate discussion areas (over there on the left). If you'd like to comment on a post or thread, there's a link at the bottom of every post. Most people start out by lurking (reading without participating) and later join in the conversation. If you read the site you'll get to know savvy contributors by their moniker. Contribute when you feel comfortable. What do I get with a 'membership' if I join Medspa MD? If you become a member, you'll gain access to everything on the site, and some special offers and deals that are offered to our members by others. You'll also be able to find, identify and communicate directly with other members who you might want to connect with. A perfect solution if you want to have an off-line conversation or as a confidential question. Most contributions come in the form of comments on posts or in the discussion areas. If you would like to write an article or post that has real information and isn't a press release or shameless pitch, you can submit a guest post or even become a contributing author. What are the policies about what can be posted on this site? No spam. The comments like 'I found a great new skin cream that really works at ________.com" get deleted so don't even try. The 'I've got all the answers over on my site' or get canned too. Just add real content or thoughts and we'll all be happier. The posting of links with 'What do you think?' comments are also sent packing. All opinions are welcome. Read the terms and conditions for a complete list. What don't you post about? There's a lot of information we don't post about. We try to keep the posts above board and generally on topic. Are you making money from this site? Is it a conspiracy? Er... Kind of. There are a few advertisers on this site that pay for the hosting of the site. (IE... Not much). I'm also aware that having this many physicians in one vertical and one place is extremely attractive to those trying to get in front of them. (We have to continually remove the spam that goes along with this.) This site was started with a blend of altruism and capitalism.